Crans-Montana is a ski resort in the Valais region in Switzerland. It is renowned for pristine on-piste skiing amid a spectacular Alpine scenery. 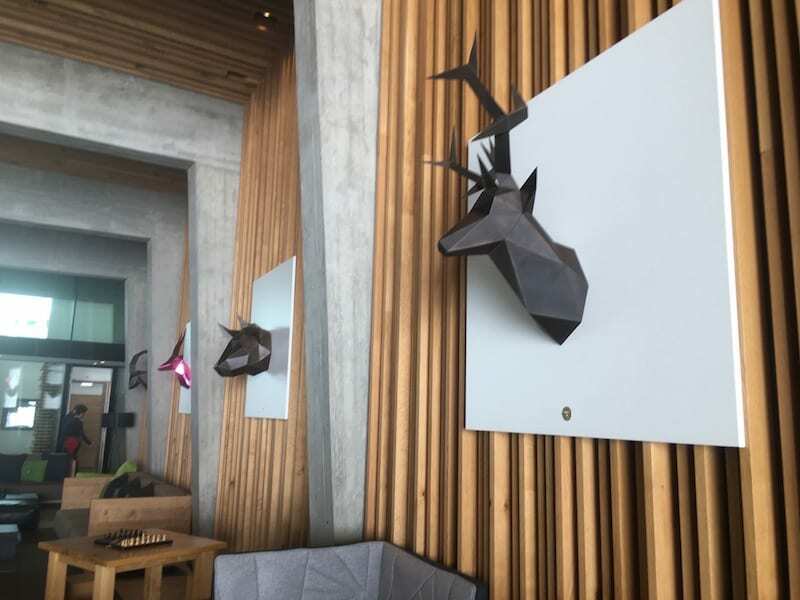 The apres-ski is well served with plenty of chic boutiques, bars, restaurants and hotels. 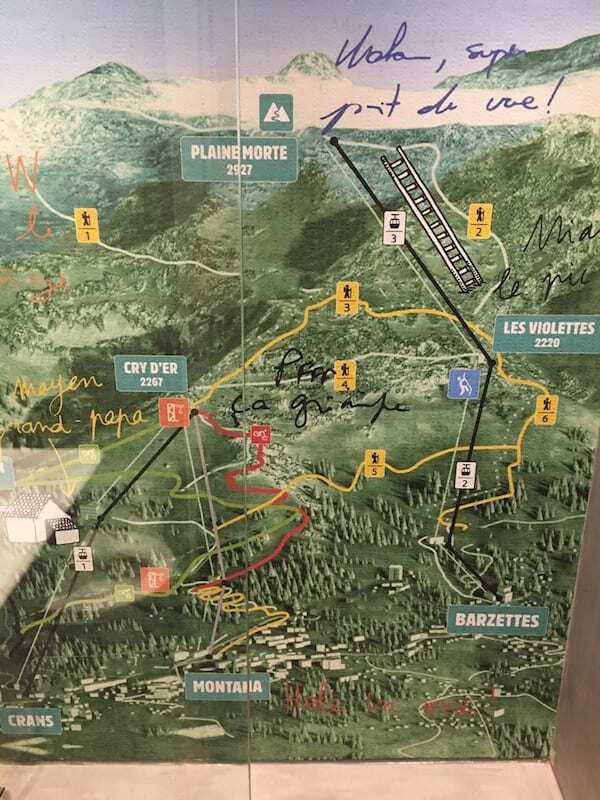 In recent news, the ski area has launched what is believed to be the world’s largest rando park, Crans-Montana Rando Parc, with 40km of waymarked ski touring. 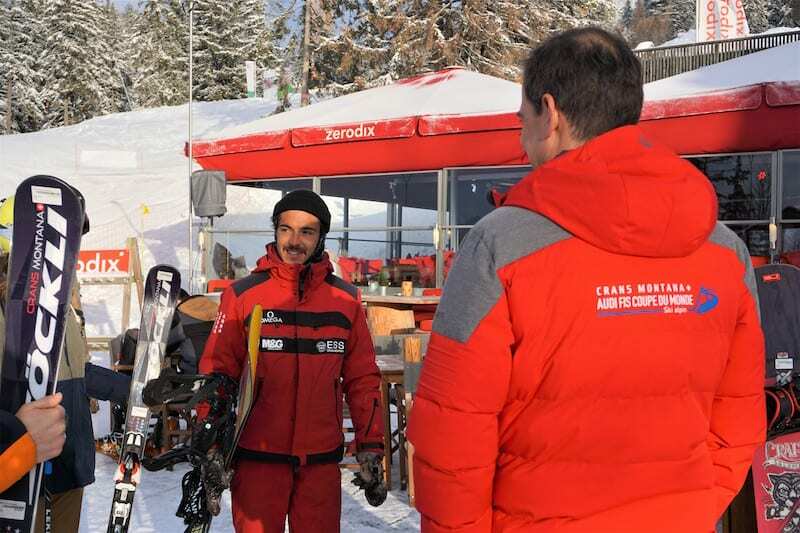 A new action sport facility, Alaïa Chalet, also opened in Crans-Montana this season. 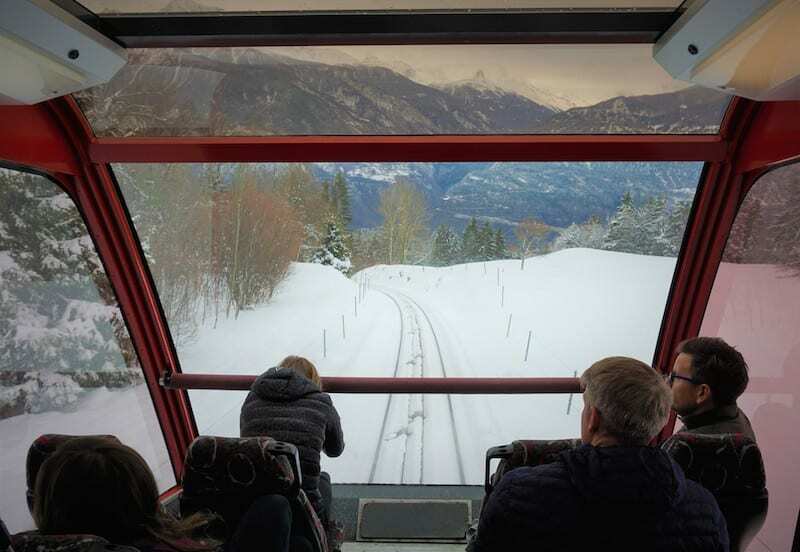 I visited Crans-Montana in January as part of a small group of journalists and bloggers. We got lucky with a good dump of snow and a fair bit of sunshine. Because of the time of year, and the mid-week break, the ski area was not busy. Wonderful views in every direction at Crans-Montana. Sunshine and pretty clouds at Crans-Montana. Beautiful Crans-Montana. Credit: Rob Stewart. Located in Switzerland’s French-speaking Valais region, the towns of Crans-sur-Sierre and Montana lie on either side of a small lake. They are linked together by a road stretching to about a mile and lined with chic looking hotels, bars, restaurants and shops. Together the towns of Crans and Montana create the up-market resort of Crans-Montana. Note that is is a town in the mountains, rather than a quaint village. This might not suit everyone but I rather liked the size of the town because there was a lot to offer when off the slopes. 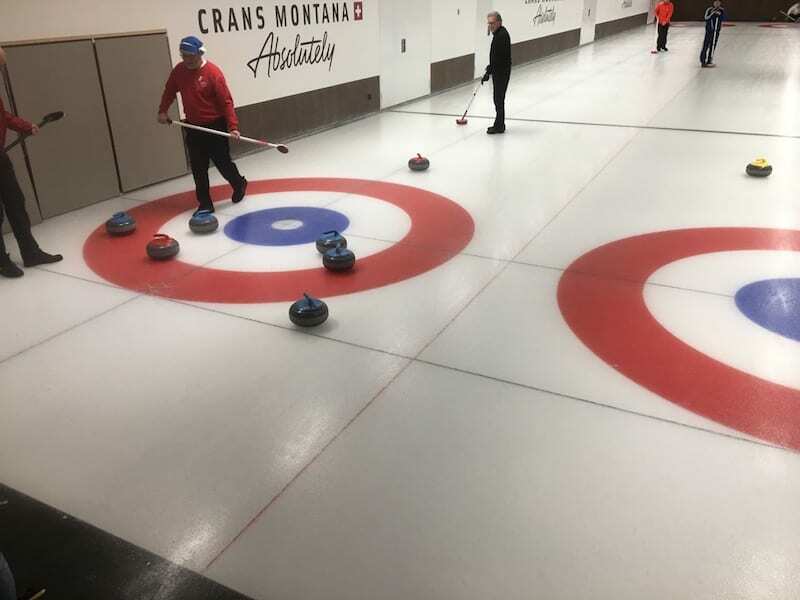 There were plenty of shops, cafes and restaurants to choose from, as well as a wellness centre, an outdoor ice rink and an indoor curling rink. The resort, which opened in 1911, is famous for its fabulous scenery, with many of the most impressive peaks of the Alps within view of Cans-Montana, including the Matterhorn, Weisshorn, Dent Blanche and Mont Blanc. In summer, visitors come for the golf and mountain activities, such as hiking and mountain biking, while in winter, it’s the skiing. There is cross-country skiing, downhill skiing and ski touring to enjoy. The resort sits at 1500m elevation with slopes rising to almost 3000m. 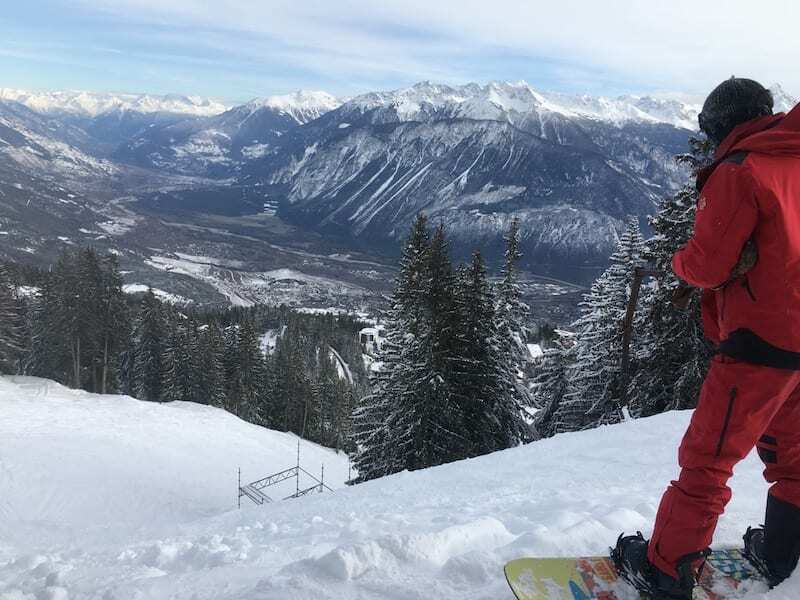 Pisted ski runs, mostly intermediate grades, extend to around 140kms, which are accessed by some 28 lifts from Crans and Montana, as well as from the village of Aminona, four miles east of Crans. According to the website On The Snow, there are 39% intermediate runs, 50% advanced runs and 11% expert runs. If you are looking for lots of black pisted runs this is probably not the place for you, although the off-piste posed plenty of challenges. There is also an impressive freestyle park. 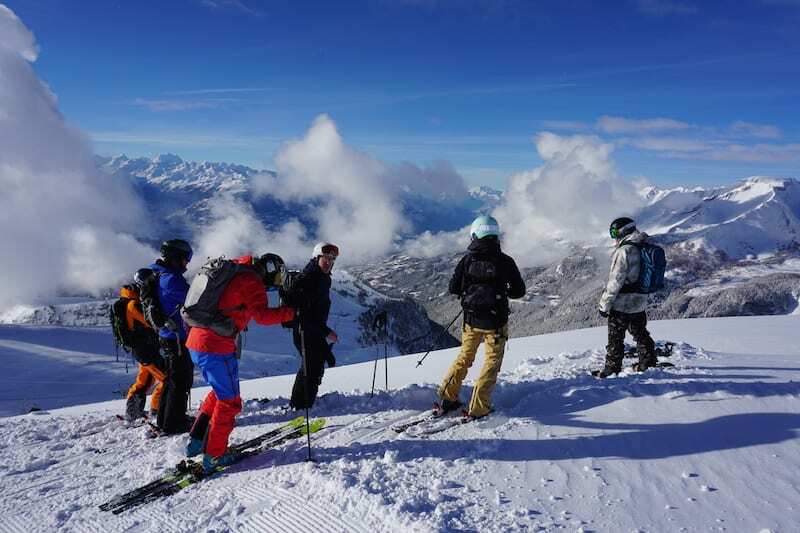 Our group enjoyed guided skiing to some of the best on-piste and off-piste areas. During a four-day trip I explored much of the resort across several mountains, including Bellalui, Plaine Morte, Les Voilettes, and Petit Mont Bonvin. Uplift is served by slick gondolas, chairlifts (some covered) and what seemed to me to be more than a few t-bars. There are advantages and disadvantages to t-bars, in my opinion. 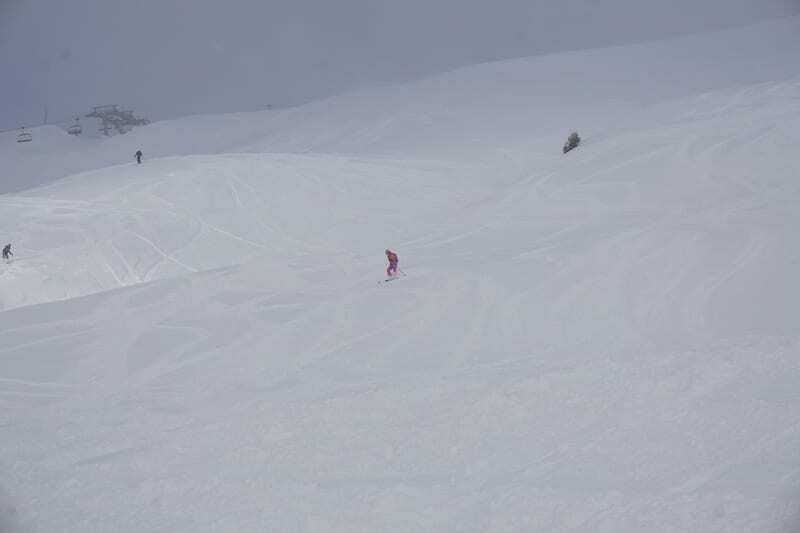 I like that they give you an up-close view of the ski slopes but they can be tricky to ride on a snowboard and you need to remember that you will get cold on a t-bar so make sure you are wrapped up well before starting. I found the resort was easy to navigate. I had an afternoon of solo skiing at the start of the trip and I am well known for getting lost. However, I managed to find my way about and enjoyed green, blue, red and black runs, as well as a few off-piste explorations, over a few hours of skiing. The slopes were well groomed and if you are a fairly good skier who enjoys carving pisted slopes all day, you’ll love this resort. The views of mountain peaks in almost every direction are superb. I prefer a bit more excitement and while I am not a massively stylish or skilled off-piste skier, I like to go where others have not. 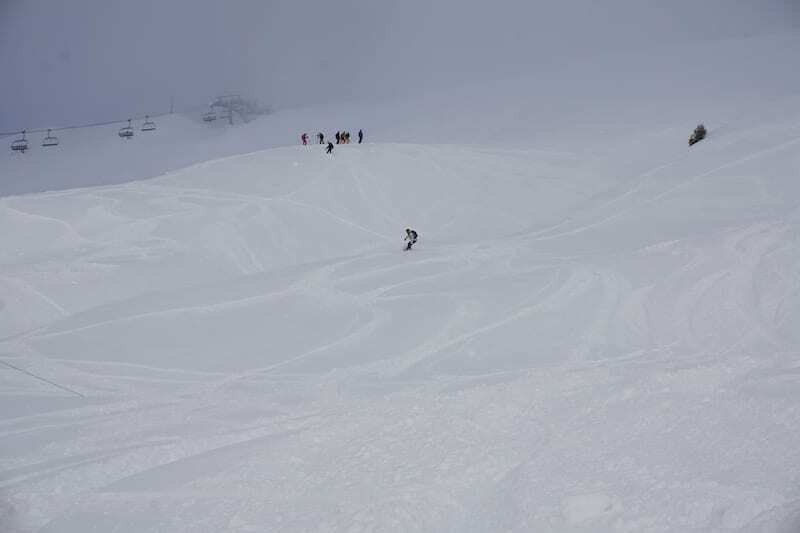 We found plenty of off-piste areas to ski and often made first tracks. 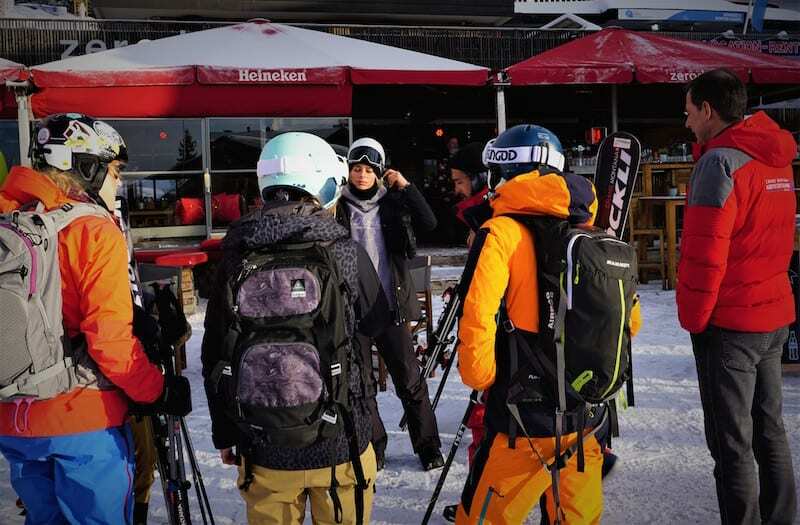 I recommend you enlist the guidance of a ski or snowboard instructor to find the best – and safest – places for off-piste skiing. Julien Cave-Tubery was our group’s excellent guide. See ESS Crans-Montana. 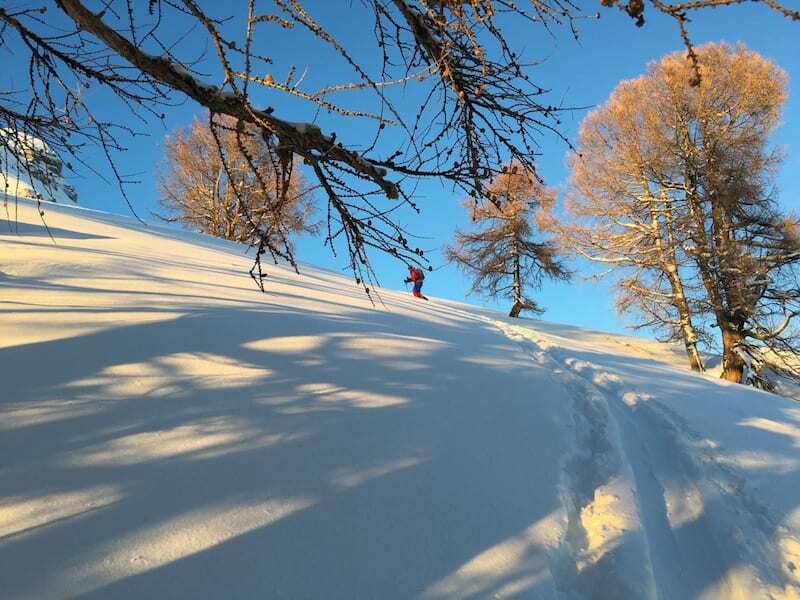 We didn’t have to go far from the groomed pistes or lifts to find powder fields and lovely routes through trees – and he showed us the best places at the right times. I think I could happily spend a week skiing in Crans-Montana, especially as there is now the option to enjoy ski touring in the Rando Parc. 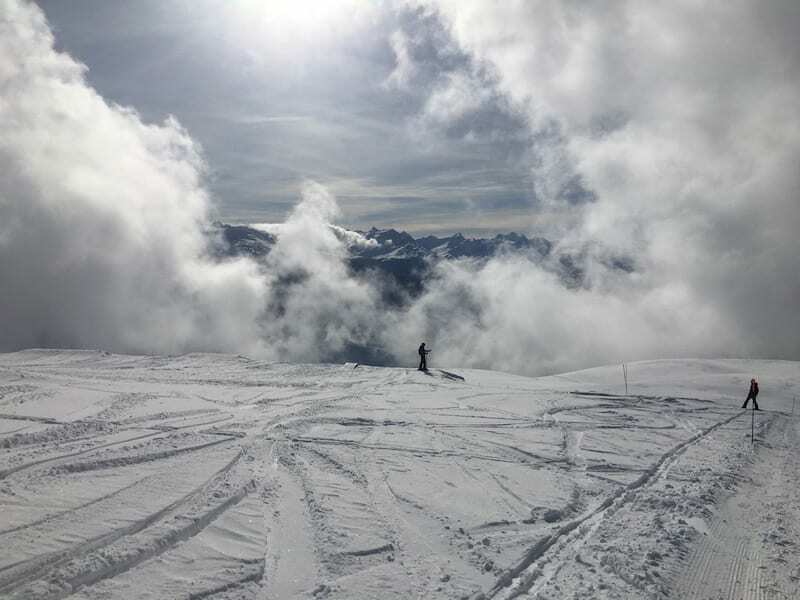 The panoramic views of so many high peaks in the Alps is reason enough to visit this area, both in winter and summer, and the skiing on pristine slopes close to so many off-piste areas (all served by a comprehensive lifts system) made for a superb few days. It’s worth noting that the resort can be sunny. This is a double-edge sword. Sunshine and snow is a wonderful combination but the sun can end up melting the snow. However, when I was in Crans-Montana there was so much snow that a little melting did not matter. The slopes were kept in great conditions so I rarely saw any ice and with a couple of fresh dumps of snow during the trip my main pursuit was to find fresh, untracked off-piste snow. I found plenty. A delicious pudding drink at the Burger Lounge. Burger Lounge: Excellent burgers. In fact, possibly the best burger I have tasted in a long time. If you have a huge appetite you might fancy the challenge of the Big Kahuna (an enormous tower of burger and extras), The dessert choice was unusual, too. 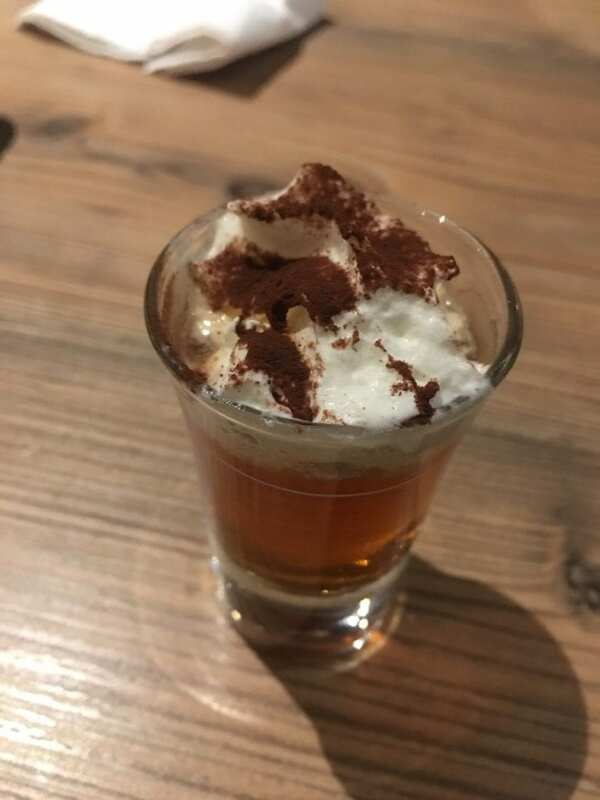 Delicious mini glasses of liqueur and cream. Yum! Chetzeron is truly amazing – and a place to spot the rich and famous. The restaurant (with 16 luxury rooms) is located at 2112m. It is not a cheap place to stay – or eat – but if you are looking for a decadent treat this is it. Our table neighboured singer-actress Pixie Lott’s no less! The lunch – we had fondue – was wonderful. The very stylish interior of Chetzeron. Le Farinet was our destination for another evening meal. Inhabiting an historic building in Crans-Montana, today the restaurant is family run by the Taillens-Palumbos. We were thoroughly spoilt with a three-course meal starting with seafood, followed by an incredible pasta, mushroom and cheese dish (the chef flamed the cheese first!) and an apple tart dessert. Restaurant Le Continental served a lovely lunch of salads, steak and chips. Mayen Restaurant of the cure was our final evening restaurant. I am pretty sure that anything would have tasted awesome after our evening ski tour (it was hard work!) but the chef did us proud with a fantastic raclette dinner. We added wine and then several schnapps for a very fun evening. The skiing afterwards back to the vehicle for our drive back to the hotel was a little bonkers! Find out more about Crans-Montana restaurants. I enjoyed the skiing – and the views. Who doesn’t enjoy a spot of après-ski? Here are some great suggestions for the best places for apres-ski in Crans-Montana. I travelled on a Monday on the earliest easyJet flight (6.30am) from Edinburgh to Geneva. There are plenty of flights to Geneva from other UK airports, such as with SWISS Air. A short walk through Geneva Airport to the train station saw me catch the 10.20am train towards Brig. I got off at Sierre around two hours later. (I love the time-keeping and efficiency of Swiss trains). Leaving Sierre train station, I followed a red line (the red line was painted on the pavements) to a funicular where I caught the train up the mountain to Montana station. I was met there by our host of the trip, Pierre-Henri, who took me by car to three-star Hotel ELITE on Route des Xires. The shower splashback in my room at Hotel Elite. There is a great deal of choice of hotels in this ski resort. 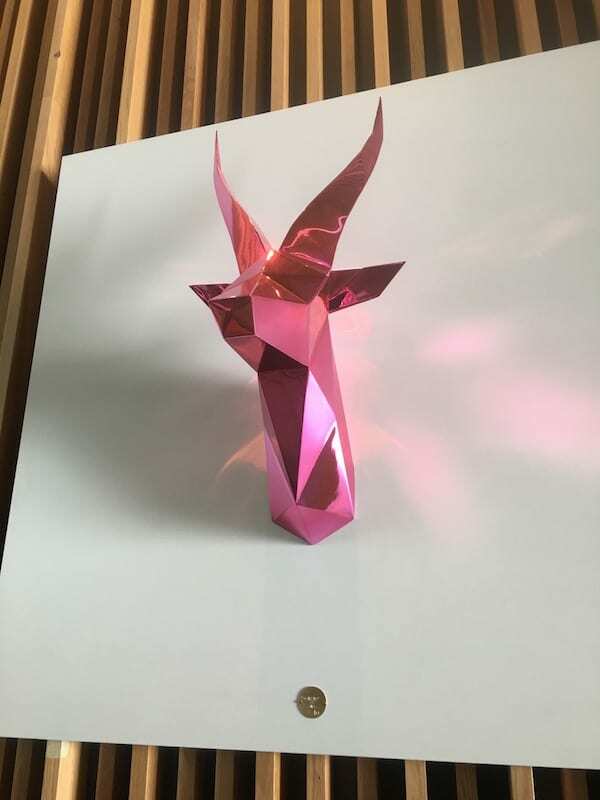 I enjoyed the stay Hotel Elite, which is located on the edge of Jack Nicklaus Golf course and at the start of a network of cross-country ski trails. Is close to the town’s amenities and entertainment and around a 10-minute walk to the main ski resort gondola uplift. Since being taken over by the founders’ daughters, the hotel has undergone a significant makeover. All the rooms are modern and designed in a contemporary style with interesting references to the history of Crans-Montana. 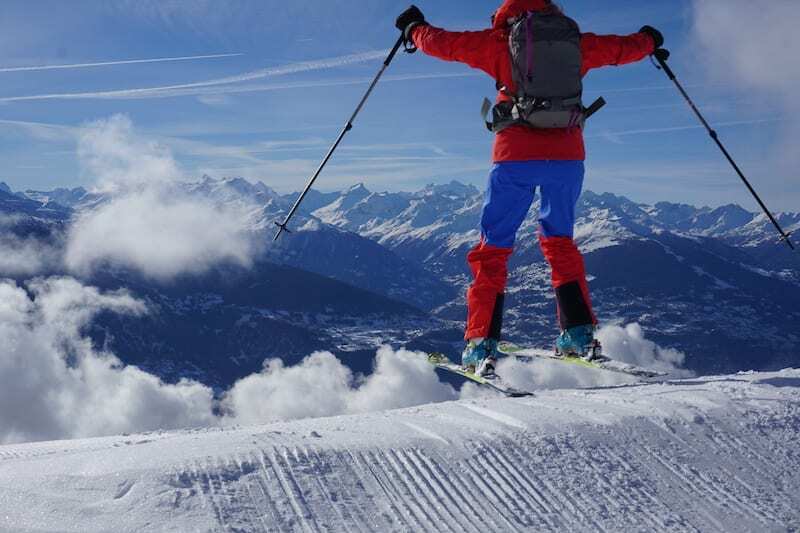 Believed to be the world’s largest ski touring park, the Crans-Montana Rando Parc offers 15 new ski touring routes (blue, red and black) with more than 40km of marked paths. 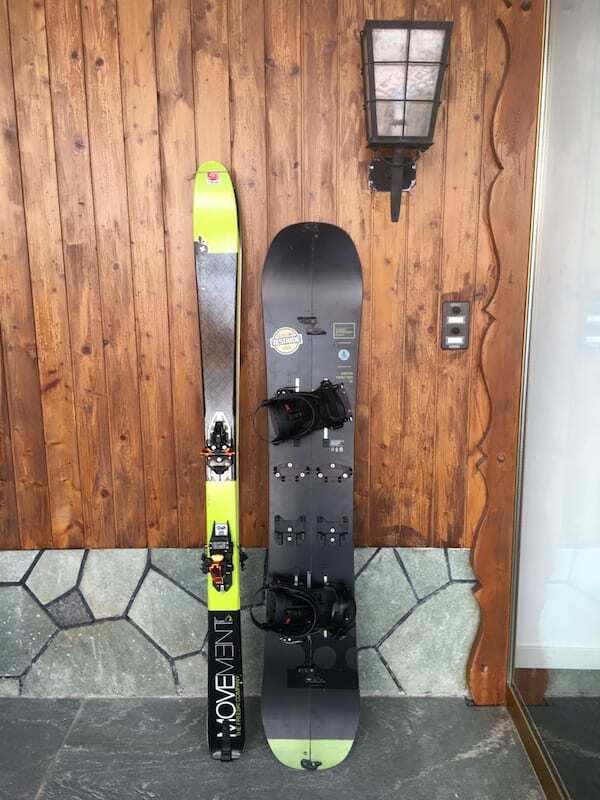 Suitable beginners, intermediates and the more advanced skier, the routes are between 1.3km and 34.7km long with a variety of elevation gains, from the “easiest” at 212m to the most difficult at 3059m. These ski mountaineering routes have been created in collaboration with ski-mountaineering champion Séverine Pont-Combe. 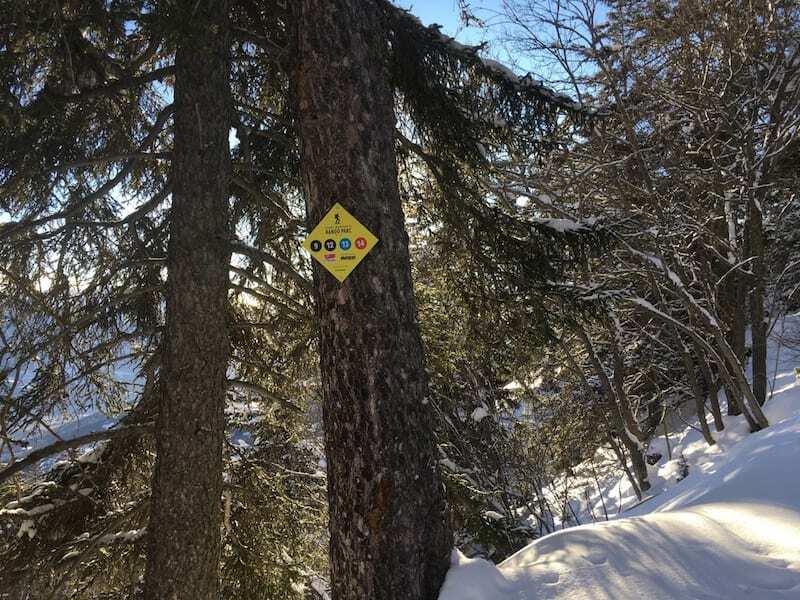 The beauty of the waymarked ski touring trails is that they are in-bounds (part of the wider resort) and linked to the groomed pistes of Crans-Montana for easier – and safer – descent. The routes are free to use although there is a daily insurance ticket that can be bought for five Swiss francs. I joined a group tour on the 5.6km Grand Loop route with an elevation gain of 871m. 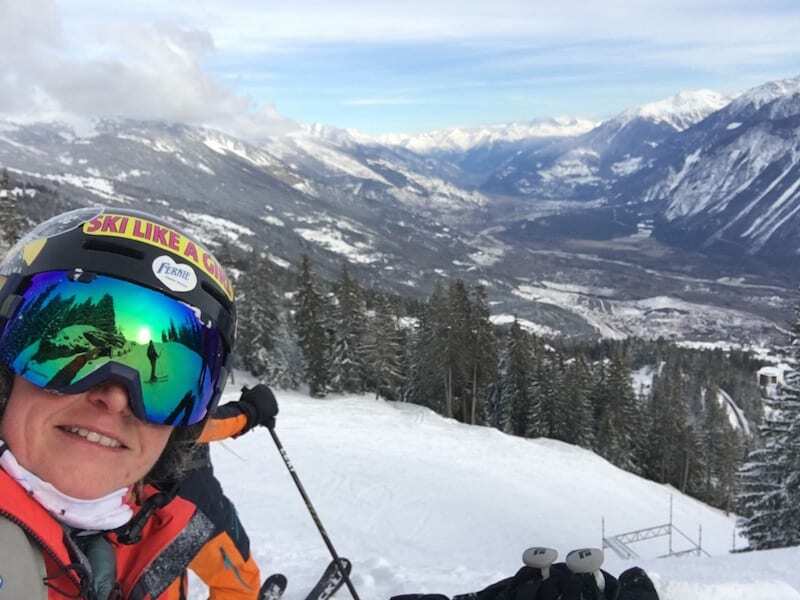 Read about my ski tour on the the Crans-Montana Grand Loop. I hired skis from the superb dedicated Rando Shop. We were privileged to be some of the first to visit Alaïa Chalet, a new action sport facility located in Crans-Montana. Read about Alaïa Chalet. 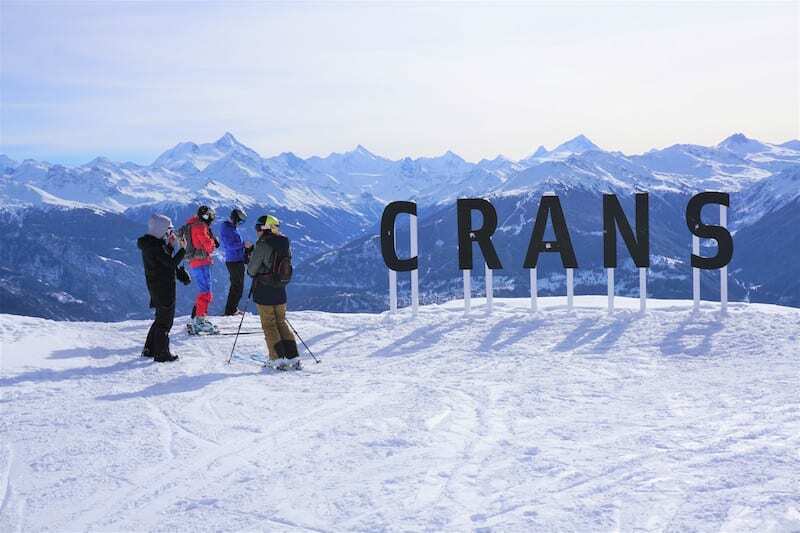 Find out more about Crans-Montana. Also see Swiss Tourism.